Most of the time this blog features something obviously related to fly-fishing, although admittedly The Unaccomplished Angler does occasionally veer ever so slightly off course. With today’s content those reading (all 13 of you) may think that I am officially and completely off my rocker, but I ask for your patience. If you wait for it I promise that you’ll see how it relates to fly-fishing as I drone on about my latest endeavor. I turned 52 this year and my mid-life crisis appears to be skateboarding: longboarding, to be exact. For those not in the know, Longboard is both a brand of beer that I rather enjoy, as well as a style of skateboard whereby the wheelbase and deck are considerably longer than the skateboards that we currently-middle-aged-types grew up on. Starting typically at 40 inches in length and extending farther, today’s longboards dwarf the 20-something inchers of 40 years ago. The manner of riding a longboard is also vastly different from what was considered ‘rad’ back in the day. The way of the longboard involves ‘campus cruising’ and downhill racing at breakneck speeds, as opposed to what we did as kids. No doubt there are still those who do tricks and ride skateboards at contoured skate parks around the globe, but it’s the longboard that intrigues me at this point in life. As a youth/teenager in the mid to late 70’s—when Saturday Night Live was in its infancy, disco threatened to musically ruin the world, Pet Rocks were all the rage, and every adolescent boy had a certain Farrah Fawcett poster on the wall of their bedroom—skateboards came on the scene with all the intensity of a raging storm off the north shore of Oahu. My first recollection of the skateboard craze was when 7-Eleven stores began selling cheap, plastic-decked boards with ‘rubber’ wheels: One could walk into a convenience store, grab a Slurpee, a pack of Bubble Yum and a skateboard for less than what a week’s worth of Starbucks Caffè Frappamacaccino drinks cost today. Overnight it seemed as though all the cool kids were getting skateboards, and in my ill-fated attempt at being cool I awkwardly jumped on that bandwagon. I distinctly remember my first board: a Makaha. It had a kicktail which were all the rage at the time. It was orange. I thought it was pretty boss. I don’t recall how much my first skateboard cost but I can safely assume that it was not a high-end offering. My older brother, Hal, got in on the craze as well. I vividly remember his board for its unique translucent blue deck which apparently allowed one to view the road underfoot, like a glass bottom boat. His board was made by Nash Skateboards, which I only know from having found the information on the internets: a veritable treasure trove of information designed to jog a fleeting middle-aged memory. With the advent of the polyurethane wheel in the early 1970’s, gone were the dangerously slippery clay wheels of yore (and the steel wheels that preceded even clay). The modern rubbery wheels gripped the pavement with an added measure of efficiency—and safety, which was a undoubtedly a good thing because back then helmets hadn’t yet been invented. I was never overly accomplished as a skateboarder, but I did a fair amount of riding. While empty swimming pools may have been a much sought-after pursuit for concrete surfers back in the day, that wasn’t my scene. Aside from an inherent lack of swimming pools (empty or otherwise) I was in a much lower class of skateboarder. I spent my time after school pushing around the junior high school grounds, tick-tacking and trying a variety of other slow-speed tricks, nearly all without success. I had an orange shirt like the awkward kid in the background. I seem to recall hand stands on a slow moving board being rather difficult, which should not have come as any great surprise given that hand stands on solid ground weren’t something I was very good at either. No, I definitely wasn’t one of the cool skater kids, like Steve Johnson. Steve was a junior high classmate who I believe may have been imported to the Pacific Northwest from Southern California. If Steve wasn’t from SoCal, he gave off that vibe. 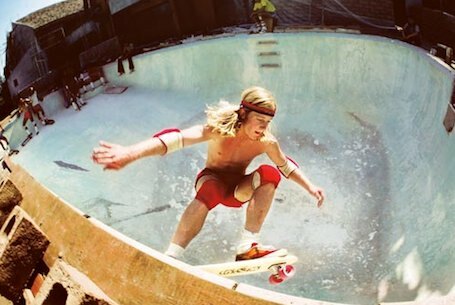 Steve was surf-cool; a veritable skateboard god and many, including myself, worshipped the board he rode on. I think I remember that he’d gone on to at least a brief career as a professional skateboarder. I wonder what he’s doing today? If he’s a fly fisherman I’ve no doubt that he’s a very accomplished angler. In an attempt to break out of my rather unaccomplished skateboarder status I figured the first thing I needed was an upgrade from my plastic cookie-cutter board. And so, in junior high wood shop, I made a board from a thick slab of oak much like the one featured in the photo above (and yes, I even had the same iconic Nike Cortez shoes). Being a teenage boy, wood figured prominently in my adolescent life and as one might imagine it (the skateboard) was very stiff. I scraped together my babysitting earnings and purchased a new set of trucks and wheels to adorn the new woody. These were obviously not the highest quality components because the open wheel bearings were prone to losing their marbles, as it were, the results of which were never good. Fortunately there was a skateboard shop at the local strip mall near the south Mercer Island QFC and Lakeside Drugs. The shop proprietor kept me in a steady supply of extra bearings, all the while encouraging me to upgrade: there were far better wheel systems that wouldn’t spew their bearings while riding. I salivated over the good stuff every time I was in the shop to buy bearings; always longing after the cool gear that my budget didn’t allow for. Much to my dismay I would remain quagmired in a state of economic repression for the remainder of my skateboarding youth. I have no particularly fond recollection of the homemade oak board whatsoever. I may have begun to lose interest in skateboards shortly thereafter, although more than likely the board was simply so horrible to ride that I banished it from my memory—there’s nothing like a thick, unyielding plank of hardwood to make one lose all sense of touch with the ground underneath. As 9th grade rolled around it marked the end of my skateboarding career and after that I never gave it much thought. Until, that is, I began snowboarding when I was in my late 30’s. Not an Olympic Gold Medalist. I had never been more than a very average snow skier (at best), but I was ultimately forced to give up skiing altogether due to foot problems that were exacerbated by the confines of cruel ski boots. The pain while cautiously snow-plowing down green runs had become unbearable and I resigned to never setting foot on the slopes again—until one fateful day. While sitting pathetically around the ski lodge while my family was out enjoying the slopes, I decided on a whim to rent a snowboard. I’d never been on one and had no idea what I was doing, but after a couple hours on a bunny slope I knew I had found enlightenment in the comfy footwear associated with snowboarding. After a private lesson during which I learned to link turns, I once again took to the slopes with a newfound enthusiasm. At the time, the overwhelming majority of snowboarders were half my age or younger: Punk kids. Young cool dudes. Shredders and slackers. I didn’t fit the mold but I did enjoy snowboarding immensely; content to cruise and carve sweeping turns while giving terrain parks a very wide berth. I’d never been a surfer, but riding the snowboard caused me to harken back to my youth—back to my skateboarding days. I dug the snowboard thing, a lot. Still do, although I rarely get up to the slopes because I’m too cheap to spend the money on a lift ticket: another sign of advancing age. It costs too damn much! Lest one should think I rushed into this latest endeavor blindly, I assure you I did my homework. I knew exactly what I was up against: decaying reflexes and increased healing time following injuries. Not to mention disapproving naysayers. It comes as little surprise that a lot of middle-aged people roll their eyes when another middle-aged guy declares that he wants to get a skateboard. Common are the off-handed remarks about asphalt’s unyielding hardness, emergency room visits and how skateboards are “an orthopedist’s dream,” so quoteth a friend who is an orthopedist. Quit harshin’ on my mellow, man. If this 63 year old dude could do it, I could do it. At this point I realized age was no longer a valid excuse to not get one and I rationalized my final decision to acquire a longboard by taking stock of my physical condition: I’m in good shape, reasonably athletic, and I’ve been practicing martial arts since 1993 so my sense of balance is probably better than average. Add to this the fact that I’m vertically challenged and I had a number of things in my favor: standing 5’7″ on a good day means it isn’t far to the ground in the unfortunate event of a tumble. So much for talking myself out of it. Through these series of articles on Brian Hines’ blog (hinessight.blogs.com), I also discovered an aspect of longboarding I hadn’t previously been aware of: Street Paddling. Yes, you read that correctly. It’s just like stand up paddle boarding (SUP) on the water, with obvious differences. First and foremost, street paddling, or land paddling, is done on terra firma, on a long skateboard, with a long pole outfitted with a rubber foot instead of an aquatic paddle blade. And while the weather may not be always conducive to street paddling, the asphalt tide is always in. 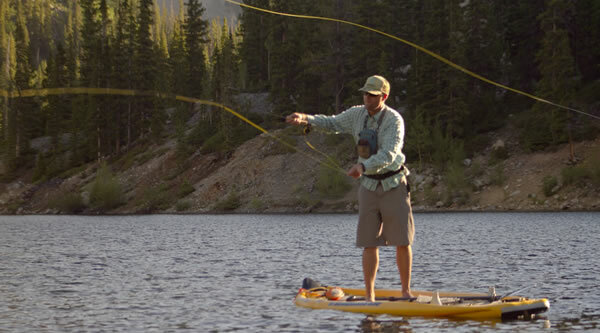 Did you know that some anglers fish from SUP boards? Fly fishing from a SUP. This land paddling discovery added an altogether unexpected and intriguing dimension to owning a longboard: an upper body workout. If I could benefit from increased fitness, this longboarding thing would take on a whole new level of significance beyond just being fun. I surmised that it could be excellent cross-training activity to stay in shape for rowing my boat down rivers (yet another fly-fishing reference). I was, like, all in, dude. Wood is good. Bigger is better. I carefully selected the style of longboard I wanted: something for flatland cruising and very (emphasis on very) gentle slope carving. A classic pintail design appealed to me, and aesthetics were important. I came dangerously close to purchasing a 39-inch Arbor Fish (for the obvious reason that I like fishing) but in the end I decided I wanted a longer longboard so I opted instead for an Arbor Timeless Pintail. I always admired Arbor snowboards but never owned one, and now was my chance. The Timeless is 46″ of shapely sleekness capped with a top deck featuring beautiful Hawaiian koa wood. With a recent trip to Hawaii still fresh in my mind, anything from Hawaii is cool by me. The deck has a gentle flex to it which allows that surfing vibe to shine through. Needless to say my new board is nothing like the oak plank of my youth. Not your father’s skateboard (unless you’re my kid). I could have ordered a complete board directly from Arbor but I opted to have the board built with slightly upgraded components by Nordboards of Chico, CA. The deck is outfitted with Paris V2 180mm 50-degree trucks (with 1/4″ riser pads), Arbor Sucrose Initiative Summit 71mm Blue wheels, and NordiK Abec 9 bearings with spacers. All geek to you? Yeah me too, pretty much. The Arbor pintail set me back $223 and change, with free shipping (I like free). That’s roughly equivalent to 3 lift passes at a local ski area (not including lunch and a beer, and gas to get there an back), or about 2 months’ worth of Starbucks Caffè Frappamacaccinos. This is certainly far cheaper than my investment in fly fishing gear, but let’s not go there—Mrs. UA may be reading and she doesn’t need to know how many rods and reels I have hidden in the closet. I also purchased a street paddle from Kahuna Creations. I selected the bamboo model because wood has soul, man, and it’s all about that flexy mellow groove when you’re out paddling the asphalt, hangin’ ten with the wind in your thinning hair. I also bought a helmet and elbow/knee pads just in case. Nobody ever expects bad things to happen so I can’t say with certainty that I won’t collide with the asphalt eventually (knock on koa). However, I’ve no need for speed whatsoever. It’s that slo stoke I’m after, man. Gear that I didn’t have as a kid. Admittedly I am just getting started but I can say confidently, after logging more than 20 miles on my board, that this street paddling thing is a great workout. I have a 2.5 to 3 mile course marked out and by the time I’ve completed the loop my heart rate is up and the feedback from my legs and upper body lets me know that I’ve gotten a good workout. As I seek out longer rides all that will increase as well. And I’ve also got a grin on my face the entire time. In my enthusiasm for this new discovery I even managed to recruit a few buddies to join in the fun. My wee lad, Schpanky, has also applied for membership in the club, bringing the average age down significantly. Playdates are more fun on longboards. Soon we’ll be paddle surfing the streets en force like a rogue band of mostly gray-haired, mostly middle-aged adolescents; ripping through cul-de-sacs adorned with children’s sidewalk chalk art at speeds often exceeding a brisk walk. People won’t be able to help but take notice. Why, just the other day a considerably younger gentleman, out walking his dog, gave me an approving ‘thumbs up’ as I paddled past. Street paddling in Duvall will be #trending soon. In my assessment a mid-life crisis is the act of a 50-something year-old (usually men) as they embrace something from their youth. Like, for instance, skateboarding. Well, I also fancied the 70’s era Plymouth Hemi Cuda when I was a kid. A good one, if you can find it, will set you back considerably more than a skateboard. Mrs. UA should consider herself lucky that, while perhaps a bit immature, at least I am fiscally reasonable. It was either a longboard, or this. The article is from 2012 so apparently I’m not quite a trend setter when it comes to Skateboarding Past a Middle Age Crisis. This past weekend featured the annual appearance of Fly Fishing Show, held at the lavish Lynnwood Convention Center. Lynnwood, for those who are not in the know, is 16 miles north of Seattle via Interstate 5. There’s not much notable about Lynnwood other than it being a sprawling hub of retail activity with an emphasis on furniture stores. Lynnwood does, however, have a convention center so it must be some sort of destination for those seeking enlightenment beyond merely shopping. The convention center is easily accessed from I-5 and shares a large parking spot with Chuck E. Cheese, and the two times I’ve been to the convention center encompass the only two times I’ve been remotely close to a Chuck E. Cheese. I don’t know how, but I managed to dodge that bullet when my kids were young. Certainly cause for celebration, I digress: back to the Fly Fishing Show. Parking is free, just non-existent. Thankfully it was a nice day for a walk so I didn’t mind having to park a 1/4 mile away and walk uphill both ways, to the show. Once you’ve been to the Fly Fishing Show, or any other similar trade show, each subsequent visit conjures up a strong sense of deja vu. Certainly it’s always good to see familiar faces and to meet some new ones, but unless there’s nothing else to do (including furniture shopping), I find that these shows offer very little of interest to me as a common attendant. So why, you might ask, do I attend? Two years ago I was invited to attend the “Authors Booth” as hosted by The Angling Bookstore, where I sat for two one-hour sessions and signed copies of the Olive the Little Woolly Bugger books for the 3 customers that were interested in that sort of thing. Last year I did not attend (I was furniture shopping). This year I was invited, along with Evan and Derek (1st and 2nd chairs, respectfully, of The Open Fly Podcast), to sit on a panel of Fly Fishing Media professionals and discuss a variety of fly fishing media-related topics, moderated by Steve Duda (Editor of The Flyfish Journal). The panel included, in addition to Derek and I (Evan had to man the Allen Fly Fishing booth so he was unable to partake), Copi Vojta (esteemed photographer and Photo Editor of the Flyfish Journal) and Brian Bennet (the man, myth and legend behind Moldy Chum). The questions were well-conceived and I believe gave those in attendance a unique glimpse into what goes on inside the various forms of media in the fly fishing industry: a veritable treasure trove of information for those seeking that sort of information to further bolster their brand. We covered topics such as blogging, writing for print publication, podcasting and photography. Engaging stuff, seriously. But what was discussed is of less significance than those who were in attendance. OK, while not altogether untrue, that may be a slight under-exaggeration: When the discussion began there were, in fact, two gentlemen seated in the conference room. The silence may have been deafening but panel was undaunted—we were, after all, professionals, so we forged ahead. As the discussion progressed 3 more people meandered into the room; 1 quickly left after realizing the neither April Vokey nor Hilary Hutchison were seated on the panel. As the discussion reached its crescendo the room began to gradually fill with others, and the panel members began to puff out our chests in a display of confidence and fly fishing media bravado. That was short lived as we realized these late stragglers were actually arriving early for the next presentation. We were kindly asked to wrap things up as the next presenter was on deck. Apparently the security detail for the next guest needed to do a sweep of the room. As they say in the media, it was a wrap. In closing, I will say this: those in attendance of our discussion got their money’s worth. And they stayed awake for the entire hour. I later learned that our discussion was forced to compete with a casting demonstration by Simon Gawesworth being held at the same time, upstairs, at the casting pond. Apparently there are more people who need help with their casting than they do with their media campaigns. While we were on Maui I had hoped to see a honu (green sea turtle). In a quest to fulfill that wish we rented snorkeling gear one day and ventured a half mile up Ka’anapali beach to Black Rock, a popular snorkeling spot for people staying at the nearby hotels and condos that line the beach. Black Rock is a large crag of volcanic rock that extends outward into the ocean, forming an enticing environment for small reef fish, and I’d heard, the occasional sea turtle. It should be noted that early in our vacation we thought it was cool to “shaka” (throw down the ‘hang loose’ sign). We would learn later that it was a total haole thing to do. Especially with both hands. As we geared up and swam along Black Rock, the first thing I noticed was how crowded the water was with others doing exactly what we were doing. It was a bit like playing bumper cars with our flippers, and when you added to that the wave action and fairly shallow water, the visibility was not awe-inspiring. Still, I was in Hawaii, snorkeling amongst a myriad species of fish I’d never seen before. Pretty cool. And then I saw my first turtle and my breathing grew more rapid. The gentle creature swam below me toward the deeper water, affording me a quick view but no photo opportunity. But hey—I had seen a turtle, mission complete! I made my way back to the beach to tell the waiting Mrs. UA of my snorkeling prowess. As I neared shore I saw a group of people crowded together in knee deep water, clearly focused on something of great interest. Upon closer inspection, that something turned out to be another turtle, cruising the shallows for what reason I don’t know. Green Sea Turtle in the shallows at Black Rock. If this particular honu was looking for human companionship it found some, although everyone honored the law and did not touch the turtle. In Hawaii seat turtles are protected under the Endangered Species Act of 1973, and Hawaii state law. I’m not sure the actual terms of the law, but I’d heard that touching or harassing a sea turtle would come with a hefty penalty if caught (as high as $25,000). Vacationing in Hawaii is expensive enough without the additional fine for touching a turtle so I made sure that I didn’t brush up against the beast. While the turtle sighting at Black Rock was cool, it would pale by comparison to what we would see a few days later. On our last full day on Maui we booked a group trip on one of the many catamarans that are moored off Ka’anapali Beach. Our token Cruise Director, Julie McCoy (not her real name) signed us up for a trip on the Queen’s Treasure, a beautiful 65′ vessel that would take us a few miles south for a snorkeling adventure at Olowalu Reef. The boat picked us up at 9 AM on the beach outside of The Whaler—very convenient. They served us some fruit and pastries en route to our destination. It was a beautiful morning for a cruise. Queen’s Treasure at Ka’anapali Beach. I’ll skip the details and get right to the meat of this post: awesome snorkeling. After the captain and crew secured the anchor line at Olowalu Reef, we geared up and hit the water. We could not have had a more perfect day for our chosen activity. No wind meant a glassy smooth surface to the ocean’s watery canopy, making visibility exceptional. We were told that a ways from our mooring spot was a “cleaning station” for turtles so we may see some. A cleaning station refers to a spot where the turtles congregate to have their shells cleaned by the thousands of reef fish. Over time the turtles’ shells accumulate a considerable layer of algae growth which apparently creates drag in the water and slows them down. In order to streamline themselves, they enter coral reef areas and let the fish do their bidding. We certainly hoped to see a turtle, but until then we were mesmerized by the plethora of coral munching reef fish. After 15 minutes of exploring the reef and observing countless different fish species, my snorkeling buddy (Schpanky) and I got into turtles. I’ll just let the following images tell the story that words cannot adequately describe. First up is a quick video that shows a freeloading turtle drifting lazily as reef fish janitors do their thing. We should all have such a good life where personal attendants abound. This honu is missing its right front flipper. And this honu is missing its left front flipper. Up for air—perhaps my favorite shot of all. OK, while Nat Geo may not come knocking on my door, I was real pleased with the quality of these photos taken with my Nikon AW1. No filters were applied; Photoshop was only used to add the watermark. It’s a sweet little camera—I hope to get some good underwater trout footage this summer. After the snorkeling excursion ended we once again boarded the Queen’s Treasure and headed back toward Ka’anapali Beach. Along the way we saw some humpback whales, which was also pretty cool. But I’ll wait to post about that until next week. After all, I need filler material—it’s hard to come up with any fishing related content this time of year, when I haven’t been fishing.